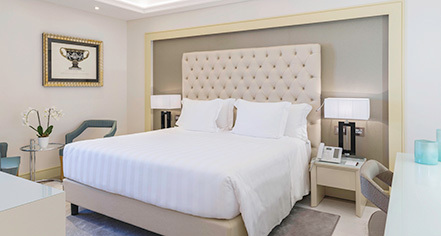 Luxurious and stylish, this guestroom offers a comfortable double-size bed and the latest technology. Stay connected with complimentary WiFi, catch up on work, or unwind in front of the 55-inch HDTV with freshly brewed coffee from the espresso machine. Enjoy all the delightful benefits of the standard European room, but with even greater levels of comfort. Many guests declare the enhanced mattresses to be the most comfortable they’ve ever experienced, with a great night’s sleep assured and a home away from home feeling that’s hard to beat. Space meets style, with a king-size bed, complete with luxurious linens, and choice of pillow for the perfect night’s sleep. Comfort and connectivity are key, with a mattress that many declare to be the most comfortable they’ve ever experienced and the latest technology at their fingertips. Enjoy complimentary WiFi, make the most out of the internet connected 55-inch smart HDTV, or stay in touch with the office at a dedicated workstation. Retreat into the spacious and modern bath, featuring bathrobes, slippers, and the hotel's signature range of cosmetic toiletries. 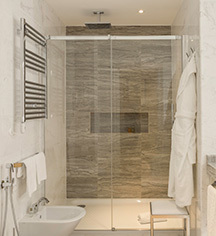 Most Deluxe rooms have a spacious walk-in shower, but some feature a bathtub for ultimate relaxation. There are four wheelchair accessible Deluxe rooms featuring a roll-in shower, plus a select number of Deluxe rooms in a twin-size bed format. With all the features of the Deluxe rooms, but with even more space, the Prestige rooms offer the enhanced Aleph experience, giving guests all the room they need for a wonderful stay. Featuring a supremely comfortable king-size bed, a third guest can be accommodated with the use of a rollaway bed. There are a select number of Prestige rooms available in a twin-size bed format; minibar is complimentary. Take in wonderful views of the rooftops and streets of Rome from a furnished terrace. There is no better way of starting the day than by watching the city come alive while sipping freshly brewed coffee from the Nespresso machine. Boasting all the features of the regular Prestige rooms, such as a fabulously comfortable king-size bed, complimentary WiFi, 55-inch HDTV, and a stylish and modern bath, the King Prestige with Terrace is the ultimate Roman lifestyle experience. This guestroom also offers complimentary mineral water.